Been there, done this. various tires are more likely to allow this potential as they age. I don't think anyone has tried to list or document this so it's a crap shoot. Experienced (those with the scars to show) take care until proven safe/soft/less sharp. As a mechanic I used to check for debris poking through the inside of tires with my fingers instead of a cloth. Not sure why I thought that was a good idea. There are numerous potential hazards when working on a bike - just have to be careful. Speaking of which, who the heck makes the tires that are branded for Bontrager? I've had an insane number of 10+ year old Bontrager tires come through here without the slightest sign of rot or stiffening. 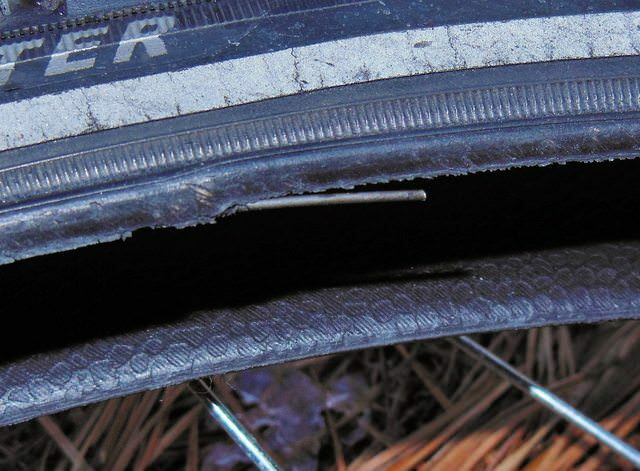 One was a front on a Trek that had a rotten Conti on the back; tread was worn, but the front tire was still soft and the sidewalls looked brand new. Guy said it was original to the mid-90s bike and the Conti was just a couple years old. Not an issue with folding bead tires.